Located minutes from some of the best wineries in Napa valley, St. Helena has a charming and walkable downtown. Have brunch on the gorgeous patio at the Acacia House, or visit Farmstead for a delicious meal made with ingredients from the property. If you want a more rustic experience, Guerneville is for you. It’s close to the Dry Creek Valley, coastal pinots, hiking, and even oysters in the town of Marshall. Visit Big Bottom Market for sandwiches and artisan provisions or grab a seat at Big Bottom’s sister restaurant, Boon. Yountville is home to the highest density of Michelin star restaurants in Napa valley. You could visit French Laundry, Bouchon and Bistro Jeanty without driving more than ten minutes in either direction. Yountville is also close to some of the best wineries in the region. A bucolic town nestled between San Francisco and wine country, Petaluma is a place where you can enjoy historic Americana and slow days. If you’re into beer and sunshine, visit the Lagunitas Brewery for tastings and delicious snacks. This coastal fishing town is quintessential of the Northern California coast. Enjoy local oysters and freshly baked bread on a first-come-first-served basis at the Marshall Store, or make reservations at Hog Island Oyster Company. You can also go for a boat ride on Tomales Bay or rent kayaks. Inverness is a small, wooded, one-store town on Tomales Bay. It’s perfect for leisurely walks, taking a boat out on the bay, oyster tasting or simply reading a book. 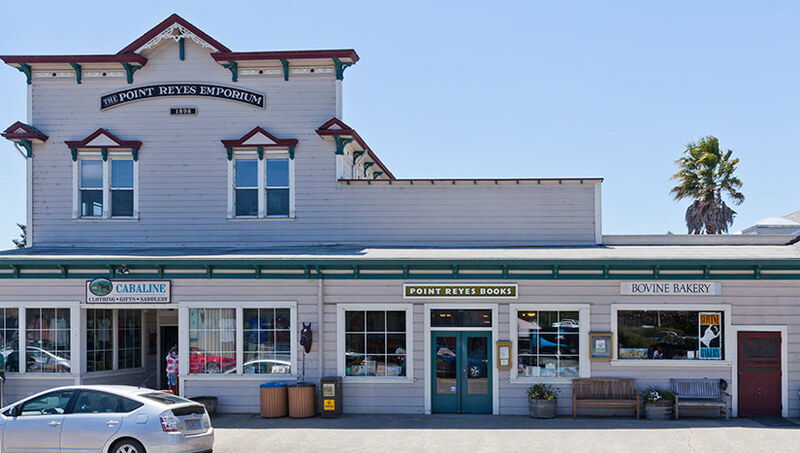 Located on Highway 1, just south of Inverness is Point Reyes Station. Point Reyes is a tad bigger than Inverness, with a great daily farmer’s market, and charming restaurants and boutiques. You can stay at one of the bed and breakfasts or at the the Lodge at Point Reyes, taking in the beautiful nature of the area. This charming seaside town has the feel of really getting away from it all. Perhaps that’s because the locals are rumored to remove the road signs leading to Bolinas every once in a while, in an effort to keep it quaint. It’s a popular spot for surfers, beachgoers and art collectors as local artists often showcase their work in one of the galleries in town. This curved crescent of beach feels almost pushed into the ocean by the Mount Tamalpais that rises up behind it. It’s a great day trip or weekend getaway as the there are a ton of activities if you like the outdoors. You can hike, surf, kayak, paddleboard, bike, and after you’ve worked up an appetite, you can relax at the Siren Canteen, which is literally on the beach, or brunch at the Sand Dollar. Tiburon is popular with the sailors and sits on an islet in to the north of the San Francisco Bay and faces the city. It has a quaint downtown as well as a ton of restaurants with a view of the water. If you’re feeling festive, check out the patio at Sam’s. You can drink bloody marys, eat oysters and watch the sailboats criss cross the bay. Located on the bay, just north of San Francisco, Sausalito is a popular tourist destination, especially in the summer. But in the fall, most of the out-of-towners go home and you can enjoy the charm of its seafood restaurants and art galleries with the locals. This coastal town nestled between Half Moon Bay and Montara is a great spot if you want a beach getaway that’s close to the Peninsula. You can rent a canoe or just relax on the beach and read a good book. Whether you like surfing or just watching it, Half Moon Bay has all the action you’re looking for. It’s home to the storied surf spot, Maverick’s, and a world famous surfing contest by the same name. If you’re feeling fancy, the Ritz Carlton has an amazing brunch. Ben Lomond isn’t a town but California’s oldest state park. It’s located high in the Santa Cruz mountains and where you can camp, hike and bike amongst the Big Basin Redwoods. This charming seaside town is just south of Santa Cruz. It has beautiful beaches, antique shops, great restaurants and boutiques. It also gives you easy access to hiking and mountain biking trails in the redwoods. Now that Highway 1 has been reopened, it’s a great time to check out this stunning state park on the Central Coast. You can camp or snag a reservation at the Treebones Resort or Big Sur Lodge, and hike to your heart’s content.